I thought I would share some more photos taken on my recent holiday in Dorset. 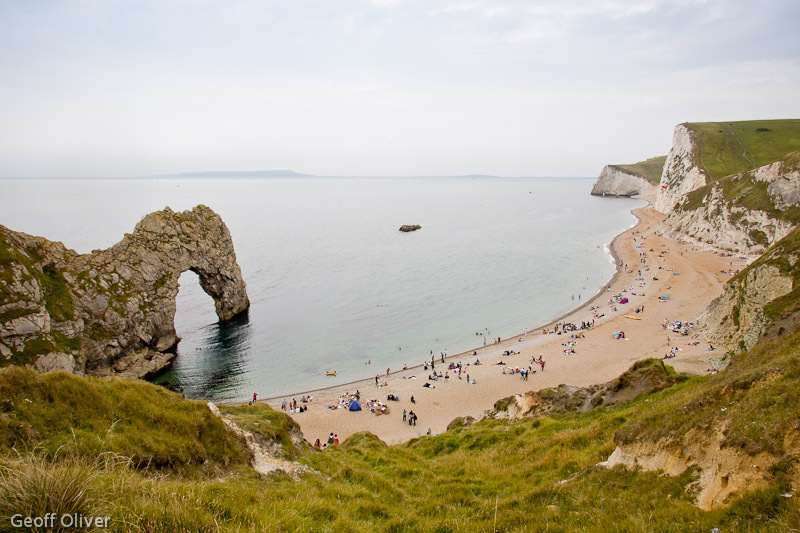 This time I will be taking you up and over the coastal path from Lulworth Cove to Durdle Door. 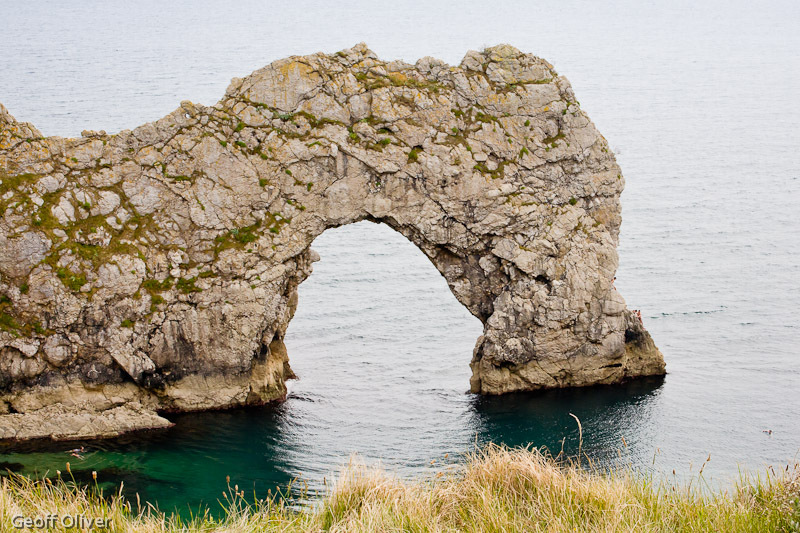 Lulworth Cove is a natural phenomenon formed over hundreds of thousands of years. 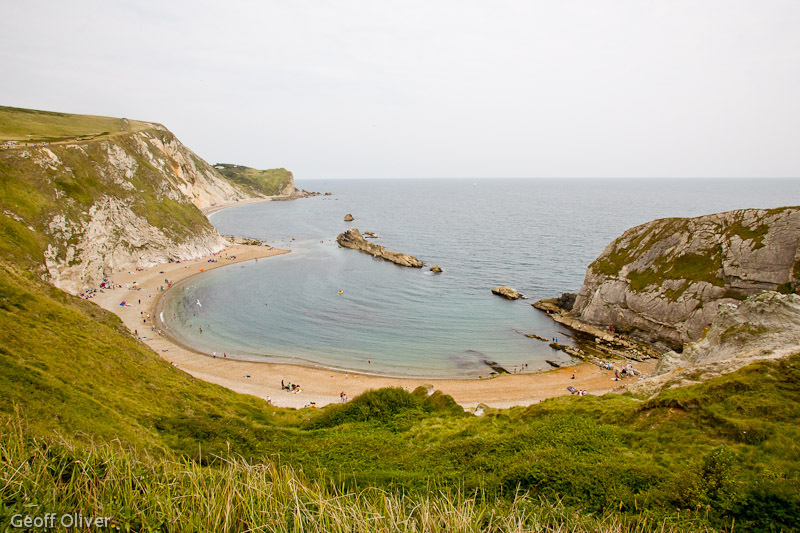 The cove, which is almost circular in shape, was formed because softer clays just behind the shoreline eroded faster than the Portland Limestone that forms the cliffs at the entrance to the bay. The faster erosion of this soft clay, with harder chalk cliffs behind it, is responsible for the impressive shape of the cove – one of the finest examples of such a feature in the world. The two photos above were taken from roughly the same place up on the grassy slopes overlooking the bay. The wide-angle shot shows the view at the wide end of my 17-35mm zoom. Even at 17mm on my full-frame Canon 5D, I was struggling to get in all of the cove. Using such a wide-angle lens also distorts the view somewhat as I was considerably closer to the bay than appears from this shot. 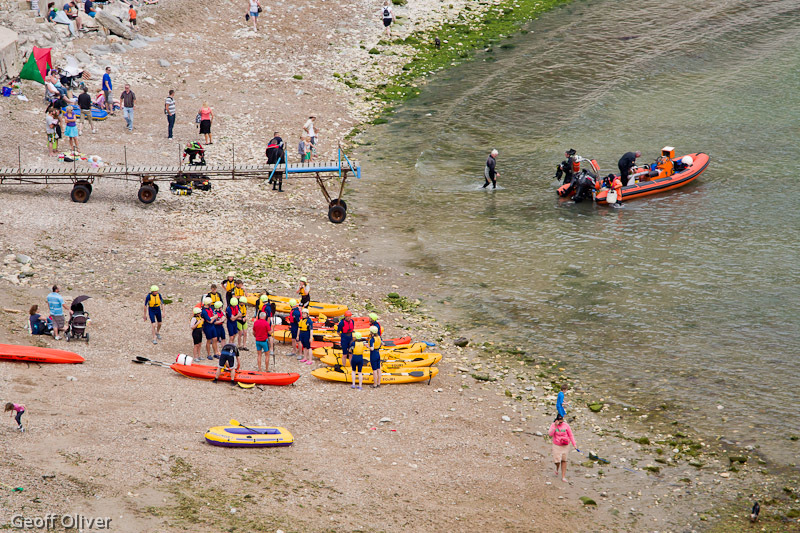 By comparison, the close-up shot of the beach was taken at the long end of my 55-200mm zoom. "Lulworth Cove is a magnet for geology students from all over the world"
Lulworth Cove is a magnet for geology students from all over the world. 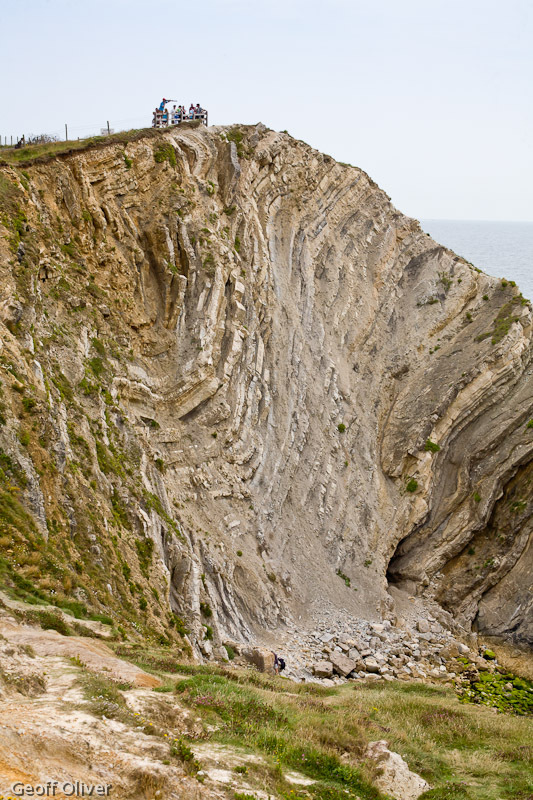 The photo above taken in the nearby “Stair Hole” shows an example of limestone folding caused by movements in the Earth’s crust millions of years ago. 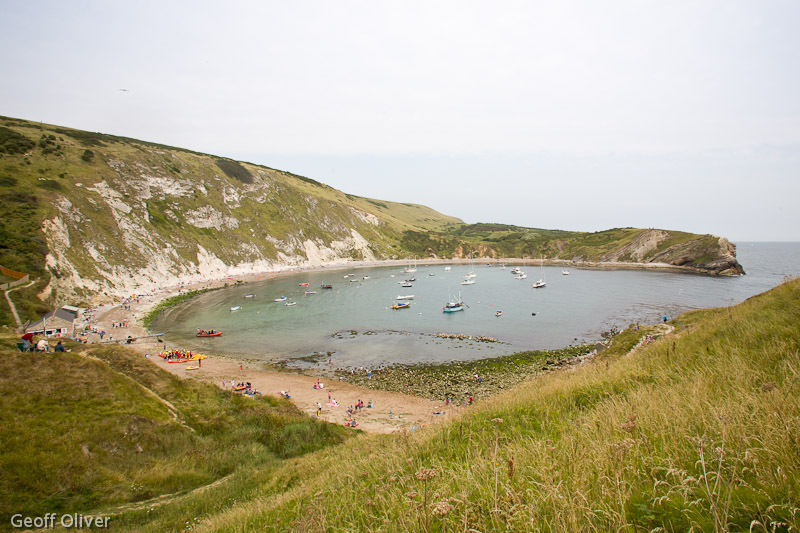 It also gives an idea of what Lulworth Cove itself would have looked like in its infancy thousands of years ago. In 2001, this stretch of coastline was granted World Heritage status by UNESCO. 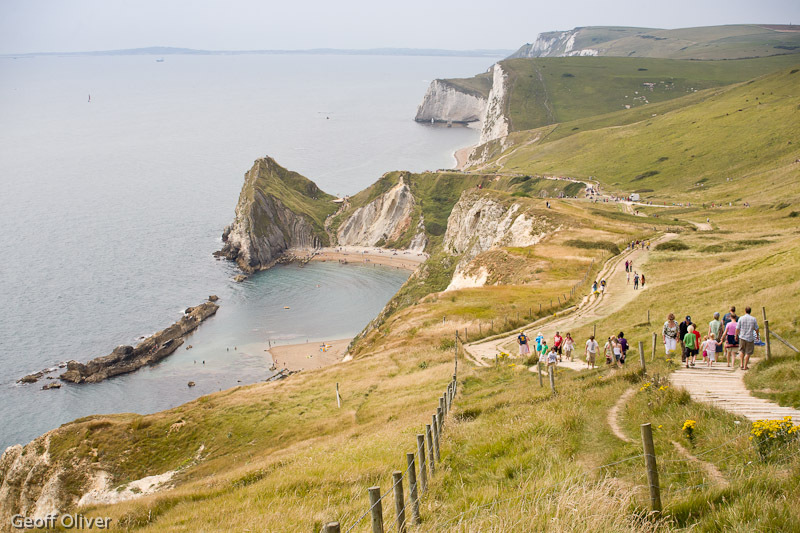 The coastal path heading West towards Durdle Door climbs steeply from the visitor centre and car park at Lulworth. My daughter Sophie and I took several breaks as we headed up the chalky path. My excuse was that I wanted to stop to take in the views, nothing at all to do with being out of breath! The rewards for our efforts were spectacular views along the Jurassic Coast. As we finally made it to the summit and the path levelled out we caught our first sight of Durdle Door, not the arch at this stage but the huge hunk of Portland Limestone from which it is formed. 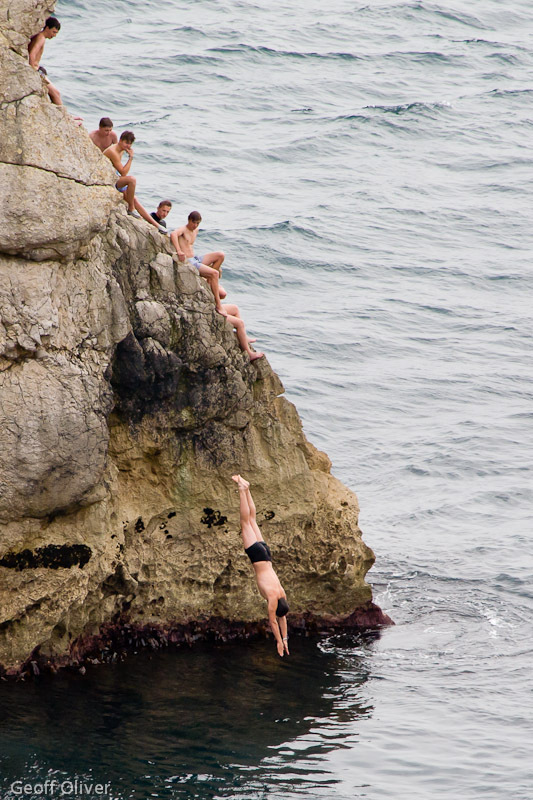 The act of jumping into the sea from various heights has recently become known as tombstoning. The practice has been in the headlines recently due to a number of incidents where there was insufficient depth of water to jump or dive into, sometimes leading to serious injury to those taking part. Diving head-first from a pier would appear to be especially dangerous and should never be attempted under any circumstances. There appeared to be no such problem with depth of water here, at least not at the time of our visit. 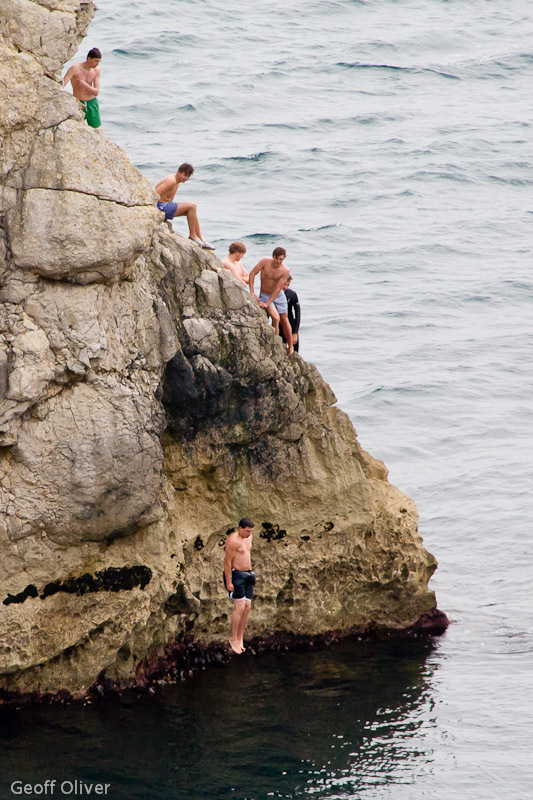 Divers and jumpers alike were encouraged by their freinds and families while entertaining casual onlookers from the beach and cliff top directly opposite. 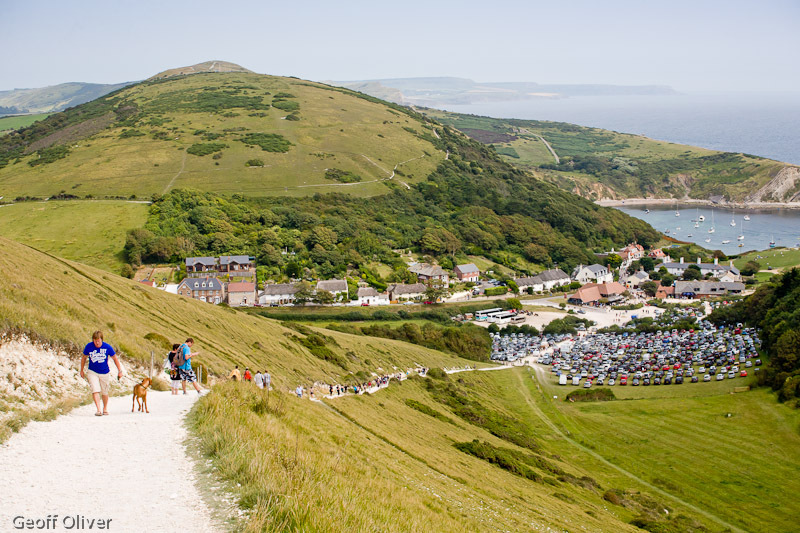 After a very enjoyable time watching the antics on the rock and enjoying the views out to sea, it was time to head back along the path to Lulworth. I stopped one more time to take in the view looking back along the beach with the arch pointing along the coast towards Weymouth in the far distance.